If you don’t have to drive in DC tomorrow, just don’t. 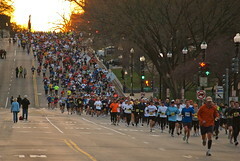 The National Marathon is run tomorrow through the streets of DC, and no quadrant is left out. Constitution, East Capitol, North Capitol, the Frederick Douglass Bridge, and various other streets throughout the District will be closing intermittently from 7am to 1pm. Chances are, you’re better off going around. In addition, Metrobus has rerouted 42 different bus routes as part of the event. Please prepare for transit pandemonium.